The DEWALT DCK263D2 20V MAX XR Li-Ion Cordless Drywall Screw Gun and Cut-Out Tool Kit features a DEWALT brushless motor in both units that delivers up to maximum run time. The Li-Ion batteries with fuel gauge provide 33% more capacity over standard packs. The screw gun offers superior performance and fast application speed (compared to corded DW272), along with maximum speed and control and high torque capability for wide range of applications. It is ergonomically designed for less worker fatigue, and provides optimum runtime for a variety of jobs. The Cut out tool provides a dust sealed switch to protect the tool long term. The new Bosch CLPK27-120 features the next generation PS21 12 V Max 2-speed Pocket Driver and the PS41 12 V Max impact driver. Both tools are compact with the shortest head length and height on the market and are small enough to fit into tight areas and corners. These well balanced tools are light weight and ideal for continuous overhead work. They also feature a new and improved 3 LED light ring that focuses more light on your working area. Makita is the innovation leader in brushless motor technology, and the DLX2187M Combo Kit provides BL Brushless Motor tools that deliver longer run time, increased power and speed, and longer tool life. The DLX2187M includes 2 brushless 3-speed Impact Drivers with 1,550 inch lbs. of torque for efficient fastening. Equipped with Extreme Protection Technology (XPT), which is engineered to provide increased dust and water resistance in harsh job site conditions. The kit includes two 18V LXT 4.0Ah batteries, and each reach a full charge in only 36 minutes on the efficient Rapid Optimum Charger the fastest charge-time in the category for less downtime and increased productivity. The 2498-24 M12 Cordless REDLITHIUM 4 Tool Combo Kit includes the 3/8-inch Drill Driver (2410-20), 1/4-inch Hex Impact Driver (2450-20), Hackzall Reciprocating Saw (2420-20) and Work Light (49-24-0145). The innovative M12 Cordless system is designed to deliver the power and torque required for professional applications, in a size that reaches the tightest and toughest places. Powered by REDLITHIUM, the M12 Cordless Li-Ion system offers unmatched power, speed and tool belt portability. 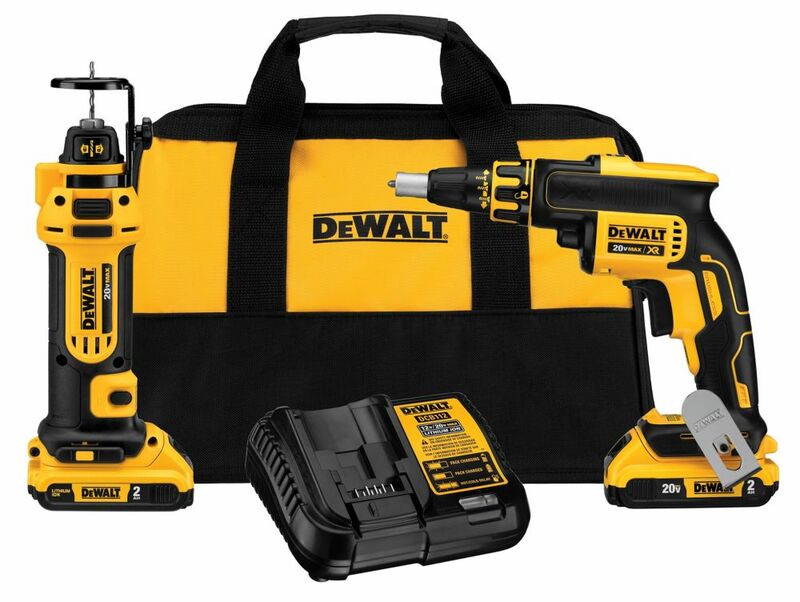 20V MAX Lithium-Ion Brushless Drywall Screw Gun & Cut-Out Tool Combo Kit with Batteries and Charger The DEWALT DCK263D2 20V MAX XR Li-Ion Cordless Drywall Screw Gun and Cut-Out Tool Kit features a DEWALT brushless motor in both units that delivers up to maximum run time. The Li-Ion batteries with fuel gauge provide 33% more capacity over standard packs. The screw gun offers superior performance and fast application speed (compared to corded DW272), along with maximum speed and control and high torque capability for wide range of applications. It is ergonomically designed for less worker fatigue, and provides optimum runtime for a variety of jobs. The Cut out tool provides a dust sealed switch to protect the tool long term. 20V MAX Lithium-Ion Brushless Drywall Screw Gun & Cut-Out Tool Combo Kit with Batteries and Charger is rated 4.6 out of 5 by 46. Rated 5 out of 5 by Sheetrocker from Great tool kit for a hanger. You will have to... Great tool kit for a hanger. You will have to get some back up batteries to keep rolling, get a bigger one for the router. It chews them up pretty quickly. Also if you live in cold bring them in from your toolbox and keep them warm. The statement about the router is especially true in cold weather.